>So I got this email from Uncle Wei about my mom’s trip to L.A. and it had all these great pictures in it. One of them was of this outrageous lemon meringue pie that my mom and Martha made. Well, I can’t really look at a photo like that without wanting pie, and since today was a baking day and we had all of these lemons from our friend’s orchard, i thought i would make a pie too. I found a recipe that I have always wanted to try for lemon pie. It had the advantage of being a double crusted pie, which I have always wanted to try because hey, why stop at 8T of butter when you can use 16? Then you take two lemons and zest them, then slice the whole lemons, pith and all really really thin. Then you throw all that in a mess of sugar (2 cups!) and then let it sit for as long as you can stand (I gave it three hours because it had to synch with the bread). Then you beat 4 eggs nice and frothy and add 3T of flour and 4T of melted butter (whoa! 20T! ), put it in the shell, cover it in its butter blanket, and blast off! Well, it turned out pretty great — nice and tart and a little bitter, sort of the marmalade of lemon pies. But boy is it ever rich. We had a coffee break this afternoon and both had a pretty nice slice and it was kind of heavy going. I hate to think what would happen to someone who tried to eat two slices. 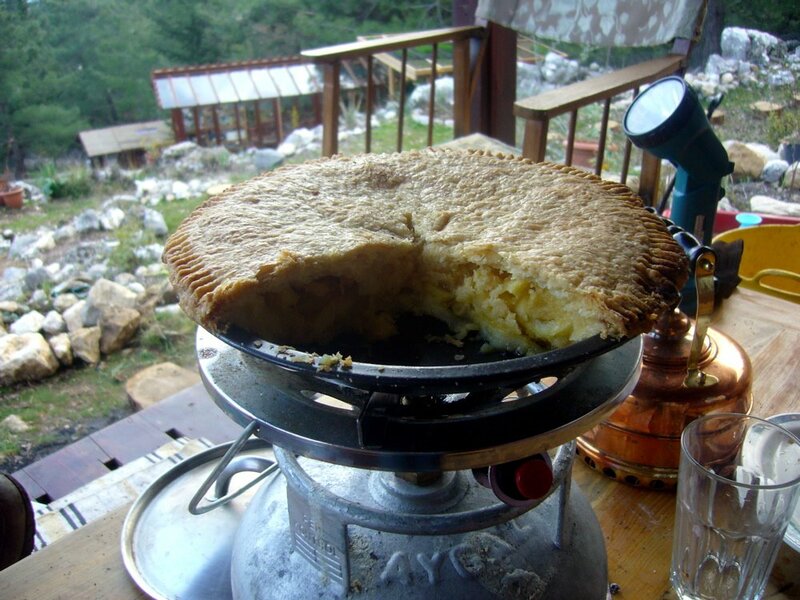 Anyway, since I love to share, here is a photo of the pie so that you will want to go and make or have a pie, too! According to him, that is his name, my name, and Ali’s name.